Village – Sangha, District Tarn Taran. Brother/Sisters : 3 brothers: Bhai Balwinder Singh ‘Billu’, Bhai Khushdeep Singh ‘Bittu’, Bhai Dilbagh Singh ‘Bagga’ and one sister Bibi Ranjeet Kaur. As Bhai Major Singh pressed the button, SP Harjit’s jeep flew 15metres into the air, killing him and his security personnel instantly and their remains splattering 100 metres apart. The Singh’s within 24 days took revenge of Bhai Sangha’s Shaheedi. Looking back at the glorious list of fallen Shaheeds in the Sikh struggle for Independence commenced by Sant Jarnail Singh Khalsa Bhindranwale, one name, which till the present day, still echoes around the areas of Amritsar & Tarn Taran is that of Bhai Sukhwinder Singh Sangha. Bhai Sukhwinder Singh Sangha was born to Sardar Gulzar Singh & Mata Mahinder Kaur on the 3rd of February, 1965 in village Sangha, District Tarn Taran. Bhai Sahib was the eldest of 5 children, Bhai Sahib had 3 brothers: Bhai Balwinder Singh ‘Billu’, Bhai Khushdeep Singh ‘Bittu’, Bhai Dilbagh Singh ‘Bagga’ and one sister Bibi Ranjeet Kaur. Note: Bhai Balwinder Singh & Bhai Khushdeep Singh were both abducted and killed in fake encounters by SSP Ajit Sandhu. Bhai Sangha completed his primary education at his local village where he was always the highest achieving student, coming first in all classes. Bhai Sahib’s secondary education was completed at S.D High School, Tarn Taran and higher secondary also at Tarn Taran, after which he enrolled at Sri Guru Arjan Dev Khalsa College, Amritsar for his B.A studies. Bhai Sangha was off a quiet, well natured and calm character. Bhai Sahib was blessed with Amrit very early in his life. From a very young age Bhai Sangha had a yearning to learn and practice Sikhi, whilst still in primary school Bhai Sangha began learning to read and understand Gurbani from Nirmale Sant Kartar Singh. By the time Bhai Sangha was in 8th class he had memorised the 5 daily prayers. Bhai Sangha, as a student, wherever he may be, would rise daily at 2am, bathe and then proceed to recite Gurbani. Bhai Sangha’s daily Nitnem lasted over 8 hours, which included Asa Di Vaar, Sukhmani Sahib, Chandi Da Paath, Rehras Sahib and Kirtan Sohila. Bhai Sangha’s daily routine also included farming with his father and younger brothers. Bhai Sangha would complete all his farming and household chores before going to school. Whilst studying in the 10th class, Bhai Sahib’s father passed away, thus all the farming and household responsibilities fell upon Bhai Sangha’s shoulders. Bhai Sangha was a very hard working person, not only did Bhai Sahib go to school then return to fulfil his farming and household duties, but also made it a priority to do Katha (discourse) at the Gurdwara every evening. Bhai Sangha also organised monthly Sri Akhand Paath Sahib’s at all historical places within his area. As a child Bhai Sangha’s favourite toy was his pistol, whilst playing with other kids, he would arrange them into armies and take command of them as they battled with one another. Rather fitting as Bhai Sangha would progress into one of the most feared (by the enemy) and loved (by the masses) Generals of the Khalistan movement. Bhai Sangha was also a very keen gatka player and regularly displayed his skills at school programs, religious functions and processions. Bhai Sangha’s gatka was not just for show, in his school and college days Bhai Sahib would vigorously confront those known for causing trouble and prevented students from being bullied. During his time at Khalsa College, Bhai Sangha became an active member of the All India Sikh Students Federation (AISSF) and regularly visited Sri Darbar Sahib where he began listening to the preaching and sermons of Sant Jarnail Singh. In these days the Dharam Yudh Morcha was in full swing, like thousands of other Sikhs, Bhai Sangha was also inspired and courted arrest for the agitation, which led him being sent to Ludhiana prison. Upon his release from jail Bhai Sangha was instructed by Bhai Sahib Bhai Amrik Singh to continue with his studies and partake in Federation activities anonymously. In June 1984, the Indian army attacked Sri Darbar Sahib, which resulted in the Shaheedi of many Singhs, Singhnia & Bhujangis as well as the destruction of Sri Akal Takhat Sahib. Bhai Sangha like millions of Sikhs worldwide was left distraught by this event. In these days the Punjab Police and army were ordered to round up the Sikh youth and illegally detain them, in fear of a new wave of resistance against the state. In August 1984, the Tarn Taran police surrounded Bhai Sahib’s village, where he along with 4 other Sikh’s were arrested. The Tarn Taran police tortured Bhai Sangha before sending him to the Army Camp where Bhai Sangha was again brutally tortured, leaving him physically very frail. In this state Bhai Sahib was sent to Amritsar prison where he was kept for over a year before finally being released on bail. working towards the creation of a free Sikh homeland. Bhai Sangha’s dedication and commitment to the movement impressed Baba Gurbachan Singh Manochahal. 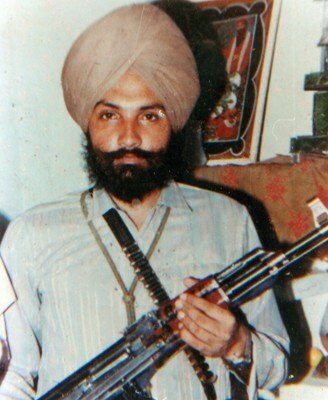 During the formation of the newly created Bhindranwale Tiger Force of Khalistan (BTFK), it’s General Chief: Baba Gurbachan Singh Manochahal appointed Bhai Sukhwinder Singh Sangha as Lt. General of the Jathebandi (Organization) and in the absence of Baba Manochahal, Bhai Sangha was given responsibility of commanding the Jathebandi. Bhai Sahib quickly began his seva by eliminating enemies of the Sikhs and was involved in many daring actions and encounters which caused heavy casualties for the Indian security forces. Bhai Sukhwinder Singh Sangha and his fellow Jujharoos of the BTFK became a formidable force operating in the Amritsar & Tarn Taran districts of Punjab. On one occasion Bhai Sukhwinder Singh Sangha had stopped over at a Sikh family’s home who were sympathisers of the movement. In this same village, Turr in Tarn Taran was a police tout who became aware of Bhai Sangha’s presence and quickly reported this news at the local police station. Bhai Sangha was resting in one of the rooms when the police swooped round to conduct a search. As the family was taken aside and questioned as to Bhai Sahib’s whereabouts, one of the conducting officers noticed a room with its doors closed over. The police suspected that Bhai Sahib was inside this room, but neither officer had the courage to find out. Who would willingly step into a lion’s den? The police told one of the family members open the doors, all this time Bhai Sangha was listening and waiting with his finger firmly on the trigger, ready to pounce. The family member opened the door and promptly moved aside. As the door’s opened Bhai Sangha glanced to confirm that the family member was out of his firing line and then discharged a barrage of bullets upon the police officers. 3 officers immediately fell to the ground and the remainder ran for their lives. What followed was an example of Bhai Sangha’s good nature; Bhai Sahib would never wish his actions to be the cause of any harm to others. Bhai Sahib knew that soon after he leaves, the police would return and begin to harass and torture this Gursikh family. Bhai Sangha sat the entire family on a tractor and escorted them to a safe place, fulfilling his moral responsibility towards them. The Indian Govt was incensed with the quick rise to fame of the BTFK and its immense popularity amongst the local’s, as the stories of Bhai Sangha & the BTFK bravery began to circulate across Punjab, Bhai Sangha’s name was on the lips of every adult and child. As a result, hundreds and thousands of Sikh youth became willing recruits for the BTFK to join the ranks of Baba Manochahal & Bhai Sukhwinder Singh Sangha. The Indian Govt knew that if this momentum continued then it was not long before the Sikh’s goal for liberation would be accomplished. The intelligence agencies hatched a plan to separate Baba Manochahal from Bhai Sangha in which they unfortunately succeeded. Ultimately it was agreed that Bhai Sangha & his comrades would operate separately from the main Jathebandi, with this decision the Bhindranwale Tiger Force of Khalistan (Sangha) faction emerged. Despite the split in the Jathebandi, the relationship between Baba Manochahal and Bhai Sangha remained unharmed, both Generals knew that their ultimate goal was the same, and continued to work towards this path with mutual respect for one another. Whenever Baba Manochahal & Bhai Sangha crossed paths, they made it a priority to stop and share Fateh with one another. To fund the newly created group, Bhai Sangha mortgaged his land for 60,000 rupees and used this to buy weapons and ammunition. The Sangha faction of the BTFK itself began to grow, amongst the big names that operated under Bhai Sangha in this group were Bhai Rashpal Singh Chandran, Bhai Baljit Singh Khela, Bhai Balwant Singh Brast, Bhai Bikramjit Singh Narla, Bhai Satbachan Singh Sakrooli, Bhai Gurbaksh Singh Ghukar and Bhai Jasmer Singh ‘Lally’. Bhai Sukhwinder Singh Sangha would repeatedly stress the importance of Sikh Rehit amongst the Jathebandi Singh’s, Bhai Sahib encouraged all members to read as much Gurbani as possible and meditate on the Lord’s name as it was only with Waheguru’s grace that their mission could be accomplished. At meetings held by the Jathebandi, Bhai Sangha made it common practise in involving each Jujharoo to take turns in reciting Bani as others listened. Bhai Sangha was seen as a saviour to the poor and was held in high esteem by people of all castes and faith’s. His respect for elders, love for children and regards elderly females as motherly figures and ladies as his sisters won him the affection of all. Bhai Sangha had helped many newlywed brides who were being abused and extorted by their in-laws to settle into their new homes. Bhai Sangha also issued warnings stating that if any person, regardless of caste or race, is facing threats of death or extortion, a report should be made to BTFK (Sangha) Jathebandi and upon investigation, action will be taken. When Hindus were leaving Punjab in fear for their lives, Bhai Sangha persuaded the Hindu’s from his village to stay put. Bhai Sangha along with his younger brothers, Bhai Balwinder Singh ‘Billu’ and Bhai Khushdeep Singh ‘Bittu’ personally provided security for the Hindu villagers. Upon hearing this, Hindu’s from neighbouring villages also sought refuge at village Sangha. Bhai Sangha had now become a household name, the security forces were frantically searching for him and his BTFK comrades. The Indian Govt had promised instant promotions and awards for any reports or information on sightings of Bhai Sangha. The security forces were given a list of the Jujharoo Singhs names which had been classed in order of most dangerous, this was known as the ‘A’ list, heading this list was Bhai Sukhwinder Singh Sangha. The reward for capturing Bhai Sangha was 25 lakh (2.5million) rupees, one of the highest amounts to have been placed on the freedom fighters. The Punjab Police and their informers were licking their lips at the potential rewards for the capture of Bhai Sangha. On the night of June 23, 1989 Bhai Sangha and 5 Jujharoo’s were at their hideout in village Musa, located near Jabbal and Bhikiwind. A tout from his village went directly to SP Operations Avtar Singh to report this information. Avtar Singh was also blinded by the idea of promotion to SSP, should he capture Bhai Sangha, however was cautious of attacking Bhai Sangha and his men at night time. SP Avtar Singh called in re-enforcements and planned to attack early morning in the hope to catch the Singhs whilst they slept. As dawn broke on the 24th of June, the CRPF and Punjab Police surrounded the Singhs. Bhai Sukhwinder Singh Sangha had already left as the Hindustani forces reached the village. The BTFK Singh’s inside led by Bhai Rashpal Singh ‘Ghuk’ were Bhai Kulwant Singh ‘Kanta’, Bhai Kulwant Singh ‘Kala’, Bhai Balwinder Singh ‘Binda’ and Bhai Manjinder Singh ‘Nanak’. The Singh’s had just completed Nitnem as they became surrounded by the Punjab Police and CRPF. The 5 Singhs did Ardaas and adhering to “Soora So Pehchaniye Joh Lareh Deen Ke Het, Purja Purja Kat Mare Kabhoon Nah Chade Khet” took up their positions. In true Khalsa spirit, the 5 brave Singhs battled with the security forces which were hundreds in numbers. The encounter lasted 10 hours, from 7am till 5pm, in which SP Avtar Singh along with a high number of CRPF and Punjab Police men were killed. All 5 Singh’s fought fearlessly till their last breathe and gained the ultimate prize for all warriors – Shaheedi. The following morning, all major newspapers were filled with reports that Bhai Sangha was amongst the 5 Singh’s who had attained Shaheedi. In villages and cities across Punjab the Sikh community held Akhand Paath’s and did Ardaas for Bhai Sangha’s Chardi Kalah (high spirits and wellbeing). Bhai Sangha responded with an announcement to the papers stating that he was alive and well. As this message was conveyed to the masses, the Sikh community became ecstatic and once again held Akhand Paath’s, this time in thanking Waheguru for Bhai Sahib’s wellbeing. Following Operation Bluestar, 2 permanent CRPF patrols were placed around Darbar Sahib and Tarn Taran Gurdwaras. Bhai Sangha issued 3 separate warnings to the CRPF to remove their troops from the entrance of the Gurdwara, however no action was taken. As a result on the 28th of December 1989, Bhai Sangha along with his unit set out to teach the CRPF a lesson. On a frosty winter’s evening the Singh’s with their AK 47’s concealed under their shawls approached the CRPF men and opened fire from close range. 4 CRPF men were killed on the spot whilst others dropped their weapons and scurried of in all directions, some taking shelter in the nearby shops. The Singh’s claimed the weapons as a token of victory and drifted off into the crowd. On the 2nd of November 1990, Bhai Sangha along with 4 other Singhs of his unit were travelling back to their hideout from the final rites ceremony of a Jujharoo Singh. The CRPF & Punjab Police led by SP Harjit Singh were on the lookout as they received intelligence that Bhai Sangha would be present at the Jujharoos bhog. The following day Bhai Sangha and his unit were sat along the banks of a canal at village Bhullar as a known associate spotted them and offered the Singhs some refreshments. The Singh’s rested their weapons against the wall with the barrel faced upwards. As the Singhs were sat down, suddenly one of the loaded weapons, fell to the ground and fired a bullet. In the early hours of the morning, the noise of the bullet echoed around the village. This noise also reached SP Harjit Singh and his squad, SP Harjit Singh instantly grabbed his wireless radio and ordered for immediate back-up. SP Harjit Singh and thousands of security forces men descended upon village Bhullar. The forces began rounding up the natives of village Bhullar and took them to a nearby warehouse. On the other side, the Singh’s led by Bhai Sangha were calm and ready for battle. The 5 Singh’s were now completely surrounded, as they proceeded forward from the canal the security forces opened fire, the Singh’s responded in kind and although the Hindustani commandos were strapped with bulletproof jackets, they fired from distance in fear of the Singhs. The 5 Singhs roared Jaikaarey as they continued their firing. The encounter played out for 5-6 hours and in many ways was reminiscent of the Chamkaur Sahib battle, i.e. 5 Jujharoo Singhs facing thousands of opposing enemies. The police forces began dropping like flies which caused them to temporarily retreat. Suffering heavy casualties and witnessing the fearless Singh’s unscathed from the hundreds of rounds fired, the security forces resorted to using mortar fire. The 5 Singh’s engaged in battle were all from BTFK-Sangha Jathebandi: General Bhai Sukhwinder Singh Sangha, Area Commander Bhai Baljeet Singh Khela, Lieutenant General Bhai Bikramjeet Singh Narla, Bhai Manjit Singh Madho & Bhai Rameshpal Singh. In the midst of the battle 3 Singhs became Shaheed whilst Bhai Sangha and another Singh continued battling with the forces. The remaining 2 Singhs however were running low in ammunition. Bhai Sangha had vowed never to be caught alive; both Singh’s knew that the time had come when they too would join the great list of Shaheeds before them. Making their final stand the 2 Singh’s roared Jaikaarey until their last bullet was fired. Eventually Bhai Sangha’s gun fell silent as he attained Shaheedi. As Bhai Sangha’s body lay on the ground, the security forces could not pluck up the courage to confirm that Bhai Sangha was no more. After much deliberation, a group of policemen were sent to check whether Bhai Sangha was still breathing. Upon confirmation that Bhai Sangha was now Shaheed, the forces instantly surrounded the bodies of the Singh’s in case the news of the encounter was leaked. The security forces placed the bodies of the 5 Singhs on a single pyre. The local villagers were not released until the bodies had been set alight, the villagers reached to witness the pyre in flames. The ashes of the 5 Singhs were taken to Bhai Sangha’s village and given to Bhai Sangha’s family. The entire Sikh community was devastated at the news of Bhai Sangha’s Shaheedi. At the bhog of Bhai Sukhwinder Singh Sangha, tens of thousands of people from all over Punjab turned up to pay homage to their beloved General. Bhai Sangha’s contribution and popularity could well be measured by the police arrangements made to keep masses away from the bhog ceremony. Despite the police forces best attempts to limit the number of people attending, the gathering was the largest ever seen at any Shaheed’s bhog. This was a clear indication of how much Bhai Sangha was respected within the Sikh community. Bhai Sukhwinder Singh Sangha’s Shaheedi was a big loss for the Sikh Freedom movement. At a meeting held by the 5 Freedom Fighter groups, it was decided that the Jujharoo Singh’s would seek revenge of Bhai Sangha’s Shaheedi. Shaheed Bhai Major Singh, a Lieutenant General of Khalistan Commando Force from UP took upon this noble mission. On the morning of 24th November 1990, Bhai Major Singh had planted a bomb on the route SP Harjit Singh travelled daily with his entourage. The Singh’s sat and waited for SP Harjit Singh, and like clockwork at 9am, SP Harjit Singh’s jeep along with 2 security forces cars approached. Bhai Major Singh waited with his finger on the button until SP Harjit’s jeep was aligned with the location of the bomb. As Bhai Major Singh pressed the button, SP Harjit’s jeep flew 15metres into the air, killing him and his security personnel instantly and their remains splattering 100 metres apart. The Singh’s within 24 days took revenge of Bhai Sangha’s Shaheedi. Following Bhai Sukhwinder Singh’s Shaheedi, the Bhindranwale Tiger Force of Khalistan (Sangha) group elected Bhai Rashpal Singh Chandran to lead the Jathebandi as it’s new General.